Visiting the office of a dentist is a scary event for most kids. But maintaining one’s dental health is also a necessity that just cannot be ignored. Taking them to the dental office from an early age is absolutely necessary to promote excellent oral hygiene habits and keep their teeth healthy. But from the point of view of the kids, a trip to the dentist’s office can be quite daunting as it involves lying on the chair in an unfamiliar milieu with unfamiliar noise while a stranger pokes into her mouth with cold, unusual and metallic instruments. Moreover, as your kids’ teeth fall out and grow, they have to complete more than almost ten trips to the dental office before they even attend kindergarten. 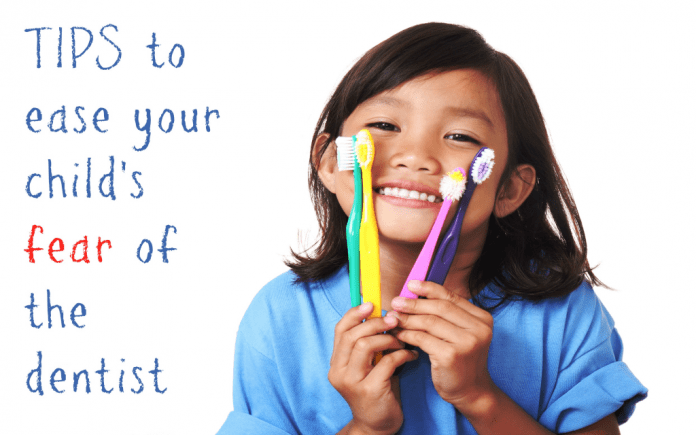 In order to make this simpler for both the children and the dentist here are some tips that you should keep in mind so that they can be relaxed and comfortable. Prior to the first dentist’s appointment you can play and pretend with your kid to be the dentist and the patient. You can use a toothbrush to count your little one’s teeth starting with the letter A or the number 1. There should not be any drilling noises or lining up other instruments. You can let the kid role play by making your kid to brush the teeth of their dolls or stuffed animals. This will help to make them more comfy with the real visit. It is recommended that you should schedule your kid’s first visit to the dentist no later than her first birthday. This is not only a great way of keeping at bay potential dental issues and getting some valuable advice on the childhood problems like thumb sucking and the right usage of pacifier but it also helps the toddler to develop a relationship with the paediatric dentist. This way they can hop up to the chair of the dentist to get the mouth examined soon. This helps them to establish their trust with the dentist from a young age. Apart from that, the stimuli like the metal equipment can be introduced to them slowly. You should not induce too many details at the time of going to the dentist especially for the first time. This will raise more questions and adding more information about a treatment like filling only gives rise to more anxiety. You should always try to keep a positive attitude at the time of discussing an upcoming appointment but you should not give your kid any false hope. You should refrain from saying things like “Everything will be alright or fine”. This will make the child lose trust in you and the dentist if she needs treatment. One reason for dental office phobia in children is that they fear that they will lose control. Letting the kids have a perceived sense of control can turn out to be helpful. For example, you can let your kid choose which tooth to polish first or the preferred fluoride treatment flavour. Also you can ask the dentist to tell the kids what they are going to do and show them the instrument prior to getting to work. You should teach your kid that visiting the office of the dentist is something that is imperative and not a choice. The dentist will ensure that her teeth are strong and healthy so that she can chew without trouble. The dentist will help in keeping away all cavities so that the kid can flaunt a beautiful smile for many years to come. Just like at one point you have to go for the quality but cheap dental implants, taking your kid to the dentist is also necessary from a very early age. With the help of the above tips you will be able to overcome their fear of dentists to a great extent so that they can have a healthy set of pearly whites throughout their lives.